Goals certainly went in last weekend in Serie A but sadly only one of these was to be found in a game featuring a Venezuelan. Furthermore, collectively the three representatives of La Vinotinto did not see as much game-time as would normally be expected, which is largely believed to be due to them having travelled such long distances to, in and from Asia for their international matches the previous week. For Video Highlights, click here. The newly promoted hosts were forced to resort to shots from distance as their opponents, with an eye on their midweek Champions League clash, were able to rest several players including Francesco Totti and Gervinho and still pick up a narrow victory courtesy of an own goal that many wiill prefer to see credited to the impressive Belgian international, Radja Nainggolan. Not long before the goal, Nainggolan also played a driving role in sponsor-less Roma’s other most notable attack, which occurred in the 41st minute. After winning a crunching tackle in midfield, he came forward and crossed a well-weighted ball in from the right that Alessandro Florenzi headed diagonally across the goalmouth that Maicon ran onto but somehow hooked against the back post when the goal was gaping. From the rebound, the ball fell to the onrushing Miralem Pjanić who blasted a shot that was blocked by a desperate-yet-determined combination of Lorenzo Tonelli and Vincent Laurini; the Bosnian international claimed that he was fouled in the ensuing skirmish but Empoli were to remain on level terms for at least several minutes longer. That was until first-half stoppage-time when Pjanić played a short cross-field pass to Nainggolan 25 yards out and he struck a low drive that came off the foot of the post, only to hit the back of goalkeeper Luigi Sepe’s head and rebound into the net. 1-0 to the capital’s leading club and, considered alongside his goal and assist on the opening day against Fiorentina, a great start to Nainggolan’s season following the formalisation of his summer move from Cagliari. Empoli’s optimistic long-range efforts came mainly from Francesco Tavano in a game which Franco Signorelli observed from the bench. The Venezuelan was doubtless on a high following his recent international debut, though travel may well have taken its toll. He will be more likely to feature this coming weekend when his side will feel they have a good chance to get off the bottom of the table when they travel to fellow recent arrivals, Cesena. 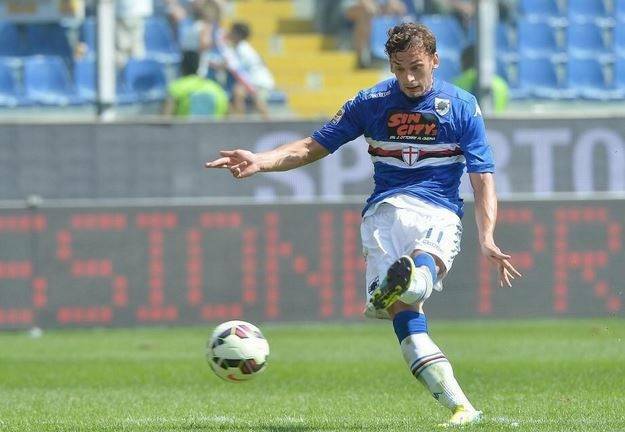 Two impressive goals, one coming in each half from Italians Manolo Gabbiadini and Stefano Okaka, ensured Siniša Mihajlović’s Sampdoria got off to a winning start at the Stadio Luigi Ferraris. This no doubt pleased their visionary movie producer-president Massimo Ferrero, whose deal with a film distribution company led to Sin City 3D being promoted on his team’s shirts. Gabbiadini’s goal came on 34 minutes from a free-kick that was curled from the dee around the wall low into the bottom left-hand corner and later on in the match he was to smash the crossbar with another powerfully hit set-piece. Though second-best, Torino were nevertheless in the game with Fabio Quagliarella and Marcelo Larrondo leading the attack, yet when they made an attacking substitution just after the hour, it was the Brazil-born recipient of a solitary Italian cap, Amauri, who was first brought on to make his debut, with Larrondo coming off. The 34 year-old former Juventus man was signed just before the transfer window closed, though given his age Josef Martínez should try not to be too concerned and instead see this as an opportunity to learn from an experienced pro in a league that not so long ago was notorious for frustrating strikers. Martínez patiently waited his turn and was later substituted on for Quagliarella in the 77th to make his Serie A debut, yet any dreams of becoming an instant hero were soon dashed when Sampdoria scored their second two minutes later. Indeed, Okaka turned into space on the right-flank and easily took the ball past Polish defender Kamil Glik – who may well have been struggling to mentally re-adjust himself after playing in a 7-0 thrashing of Gibraltar in midweek – and then fired home from an angled position to seal the 2-0 victory. With 8 shots on target (from a total of 18) to their opponents’ 1 (from 5), Fiorentina had the bulk of the opportunities but were unable to make the breakthrough, as Genoa managed to hold on and get a point when defeat often seemed a formality. That it remained goalless was all the more surprising when one takes into account the 3-3 draw that occurred in this fixture last season, not to mention the 5-2 Fiorentina victory enjoyed at Genoa’s ground nearly a year ago. Alberto Aquilani, Borja Valero, Khouma Babacar and especially Juan Cuadrado were all a frequent menace to the Genoa defensive lines, regularly running directly through the midfield with ease and creating numerous chances throughout the game. Their best of the first half came after 15 minutes when Aquilani – who, incidentally, was the only Italian in the home side’s line-up – put in a graceful cross from the right that dipped kindly six yards out for Mario Gómez. However, the injury-hit German was unable to make meaningful contact with the ball as it instead hit a combination of his chin and chest before going tamely wide. Little was seen of Genoa as an attacking threat in the opening half as they were preoccuppied with repelling attacks. Due to being frequently overrun in midfield, manager Gian Piero Gasperini took off the yellow-carded Andre Bertolacci at half-time and replaced him with ‘Gattuso 2.0’, Tomás Rincón, who was most likely omitted from the line-up due to the travel involved with the preceding week’s international duty. However, though the visitors did get a little more into the game, the onslaught, if anything, increased with Cuadrado continuing to shine as goalkeeper Mattero Perin was required to put in a man of the match performance to thwart the Viola. Rincón, like Bertolacci, was to find himself regularly on the back foot struggling to halt Cuadrado’s trickery, unpredictable runs and movements, as he picked up a booking in the 78th minute for tripping the Colombian on the turn just outside the area. Just over five minutes prior, another South American, Rincón’s team-mate, the Argentine defender Facundo Roncaglia, also had great difficulties dealing with Cuadrado. He was penalised for holding him back near the halfway line, thus receiving his second yellow card and walking off to a smattering of applause from fans of the home team who actually hold his registration. Despite Fiorentina’s dominance, Gasperini’s men did nearly score after 64 minutes when Edenilson robbed Cuadrado and Valero in his own half and ran down the right side, playing a one-two before crossing in for Mauricio Pinilla whose acrobatic scissor-kick bounced before going narrowly over the crossbar. The Chilean forward can be praised for this effort but was to spend the majority of this match in isolation, disappointed by the dearth of service from the flanks, which was in marked contrast to the season’s opener against Napoli. Ultimately though, despite these frustrations, Genoa will be more than pleased with the point they earned and it was largely Perin who they have to thank for this. Indeed, his heroics were especially required in stoppage time when, in quick succession from two corners, he tipped over Gonzalo Rodriguez’s rasping shot from the edge of the area and, subsequently, gratefully clung on to a header from debutant Filippo Bernardeschi that was powerful yet lacking in direction. Thus, Genoa travel back north with a point some will feel they did not deserve and will continue their difficult start to the season with a home game this weekend against Lazio. This entry was posted in Venezuelans Abroad and tagged Europe, Franco Signorelli, Italy, Josef Martínez, Serie A, Tomas Rincón on September 20, 2014 by hispanospherical.